Now the party can go anywhere. The StowAway® Portable Bar Sets up in only 10 seconds. This truly portable bar is ideal for any outdoor setting. 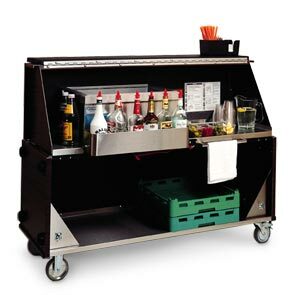 From poolside to catered events, convention centers and banquet halls, this totally portable bar sets up or breaks down in just four easy steps and can be easily stored away for both safety and convenience. The cabinet is constructed of heavy gauge aluminum with vinyl-metal laminate. Step 1. Open lower hinged panel out and up. Step 2. Pull handle up, until latches engage. Step 3. Place speed rail in serving position. Heavy gauge black vinyl clad aluminum exterior surfaces. Stainless steel ice bin with drain and petcock valve, holds ~ 95 lbs of ice. 24" removable stainless steel speed rail.